It’s Ada Lovelace Day, an international day of celebration of women in STEM fields. The Geek Feminism blog made the point in the post “How Not to Do Ada Lovelace Day” that the ideal outcome of ALD would be to end the invisibility of women in science and technology, and so participants should strive for more than generic “Yay, women in science!” statements. I agree, and as most of my mentors have been men, my contribution to the ALD blog carnival is to profile a woman in science whose work has been really important to my field (ecology): E. Lucy Braun. Emma Lucy Braun was born in 1889 to rather strict and controlling parents; much of her early education was at home, as her mother was a teacher. She and her older sister, Annette, were fond of the outdoors, and Lucy began pressing plants in high school. Lucy went on to study geology and botany in college, becoming the second woman to earn a PhD from the University of Cincinnati in 1914 (Annette, with a PhD in Entomology, was first). Dr. Braun ultimately become a professor of Plant Ecology at the University of Cincinnati, training 13 MS and 1 PhD student (nine of whom were women) before retiring from teaching to focus on her research. This was highly unusual for women professors at the time, as most focused on teaching, rather than graduate mentoring and publishing original research. The Braun sisters never married, but lived together in their Victorian home in the Ohio valley until Lucy’s death in 1971. They bought an automobile in 1930, taking extensive trips throughout the Appalachians to map, record and photograph the flora. Often, they had to contend with the dangers of moonshiners in the Kentucky mountains, but two sisters traveling alone weren’t typically considered a threat (and they never reported the mountain stills), so they often befriended the locals who would then direct them to the best mountain trails. Dr. Braun published 180 articles in 20 journals during her career, but is perhaps most widely remembered for her 1950 book Deciduous Forests of Eastern North America, which was the culmination of 25 years of fieldwork and 65,000 miles traveled for field excursions. This book is a classic reference in ecology that is still widely used today. She was the first to identify the mixed mesophytic forest as a distinct system, identified several new species and varieties, and worked tirelessly to promote conservation and preservation in her home state of Ohio. Her work on glacial refugia and postglacial plant migrations provided some of the early foundations for North American paleoecology (though many of her hypotheses were later disproved by paleo-reconstructions from pollen data). 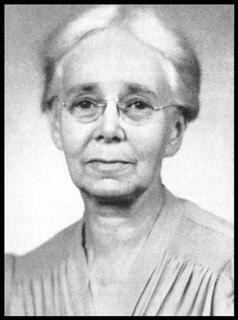 Unlike many early women in science, Dr. Braun was recognized by her peers for her contributions; she was included in the 50 most outstanding botanists by the American Botanical Society in 1956, was the first woman officer of the Ecological Society of America (vice president) and elected the first female president of ESA in 1950 (ESA also has an award in her name). So, the next time someone asks you if you can name a famous woman scientist, you can name Emma Lucy Braun, which is better than 65% of Americans and 66% of UK residents can do. And, because it’s equally important to highlight the accomplishments of current women in science, I’ll leave you with a few women paleoscientists you should know: paleontologist Dr. Liz Hadly at Stanford, paleoecosystem ecologist Dr. Kendra McLauchlan at Kansas State, paleoclimatologist and diatomist Dr. Sheri Fritz at the University of Nebraska Lincoln, paleofire ecologist Dr. Cathy Whitlock at Montana State University, and biogeographer Dr. Felisa Smith at the University of New Mexico. P. S. To honor Ada Lovelace Day, why not make a contribution to a Donors Choose classroom project in honor of a woman in STEM who has inspired or mentored you? Damschen, Ellen, Kristen Rosenfeld, Mary Wyer, Deena Murphey-Medley, Thomas Wentworth, & Nick Haddad. 2005. Visibility matters: increasing knowledge of women’s contributions to ecology. Frontiers in Ecology and the Environment 3 (4): 212-219. Durelle, Lucile. 1981. Memories of E. Lucy Braun. Ohio Biol. Surv. Biol. Notes No. 15. Stuckey & Reese, Eds. Langenheim, Jean. 1996. Early history and progress of women ecologists: Emphasis upon recent contributions. Annual Review of Ecology & Systematics 27: 1-53.